Konsole: schwarz. Original Playstation 4 Slim Konsole in Schwarz. - Gebrauchsspuren an der Konsole. Integrierte Original 500GB Festplatte. HDMI-Anschlusskabel für TV. 237,95 EUR. 199,95 EUR. Microsoft XBOX ONE Konsole 500GB Schwarz Contr. 139,95 EUR. Tipologia console Console Fissa. GIOCO A SCELTA. Altre specifiche ingressi / uscite Input/ Output Super-Speed USB (USB 3.1 Gen1) port × 2 AUX port × 1 Networking Ethernet(10BASE-T, 100BASE-TX, 1000BASE-T)×1 IEEE 802.11 a/b/g/n/ac Bluetooth®v4.0. 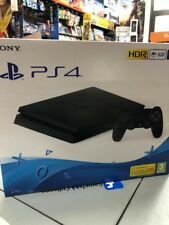 Playstation 4 500GB F Chassis Slim Black. Dualshock 4 V2 Black. tutta Italia. e condizioni sempre migliori. SARA'SUBITO RICAMBIATO! disponibbilità del prodotto. serietà e affidabiltà. per qualsiasi informazione riguardo al prodotto non esitate a chiamare! Diritto di Recesso Per gli articoli provvisti di bollino SIAE, il prodotto deve essere restituito con il bollino integro. Non saranno accettati resi di articoli con il bollino SIAE rotto o mancante. Original Playstation 4 Konsole in Weiss. - Gebrauchsspuren an der Konsole. - Kratzer (speziell an den Hochglanz Bauteilen). Integrierte Original 500GB Festplatte. HDMI-Anschlusskabel für TV. Microsoft XBOX ONE S Konsole 500GB GO GRAU Con. 197,95 EUR. The console was striped down and cleaned. The console was striped down, cleaned and new thermal paste on APU was applied. There's a small paint chip on the ON switch but it doesn't affect its function. The console was striped down, cleaned and new thermal paste on APU was applied. Original Playstation 4 Slim Konsole Silber. - Gebrauchsspuren an der Konsole. - Kratzer (speziell an den Hochglanz Bauteilen). Integrierte Original 500GB Festplatte. HDMI-Anschlusskabel für TV. Microsoft XBOX ONE S Konsole 500GB GO GRAU Con. 197,95 EUR. PLAYSTATION 4 CONSOLE. WHAT YOU GET. Original Playstation 4 Slim Konsole. - Gebrauchsspuren an der Konsole. Integrierte Original 500GB Festplatte. HDMI-Anschlusskabel für TV. 237,95 EUR. Microsoft Xbox ONE Konsole 500GB - SCHWARZ - OH. 79,95 EUR. Die Konsole ist in sehr gutem Zustand, weist wenige Gebrauchsspuren auf. Klavierlack hat feine Kratzer. Type: PlayStation 4. Colour: Black. Connectivity: Bluetooth 4.0; USB. Optical disc drive: Blu-ray. Features: High Dynamic Range. Gebrauchsspuren an der Konsole. Integrierte Original 500GB Festplatte. HDMI-Anschlusskabel für TV. Microsoft XBOX ONE Konsole 500GB Schwarz Contr. 139,95 EUR. Nintendo Wii U 1 BASIC Konsole WEISS 8GB Pad. 129,95 EUR. Sony PlayStation 4 500GB Spielekonsole - Glacier White (CUH-1216A). - Die Konsole ist in sehr gutem Zustand, weist wenige Gebrauchsspuren auf. Item is in very good working condition and has been well looked after. - Includes console and power lead only. - Console has been reset to factory settings. You Must keep this console on this firmware until your warranty expires. Playstation 4 Slim Konsole mit einer 500 GB Festplatte sowie Strom- und HDMI-Kabel. Die Konsole ist gebraucht und befindet sich in einem. Technisch befindet sich die Konsole in einem tadellosen Zustand! Microsoft Xbox 360 S Slim 250 GB Zubehörpaket: Orig. Co. 5x Assassins Creed OVP. Microsoft Xbox 360 S Slim 4 GB Zubehörpaket: Orig. OVP 3x Need for Speed. Kinect Adventures ! Nintendo DS silber Zubehörpaket: Ladekabel Tasche Pen Pokemon ! 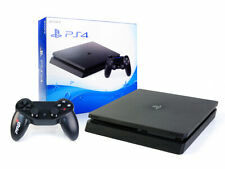 Sony Playstation 4 500GB console. Complete with 500GB Hard drive. Tested and fully working. Original Playstation 4 Slim Konsole Silber. - Gebrauchsspuren an der Konsole. Integrierte Original 500GB Festplatte. HDMI-Anschlusskabel für TV. Microsoft XBOX ONE S Konsole 500GB GO GRAU Con. 197,95 EUR. Hard drive capacity: 500 GB. Discover a revamped PlayStation console 30% smaller and lighter than the previous model and more energy efficient. The new form factor features a slanted body design and soft curved angles for a modern look that looks great in any bedroom or living room. The outer box has a couple of tears but these will be taped up well with clear tape and hardly noticeable. Original Sony Playstation 4 Spielekonsole Schwarz. Es handelt sich um geprüfte Gebrauchtware. Viel Spaß beim Spielen! Original Playstation 4 Slim Konsole. - Gebrauchsspuren an der Konsole. Integrierte Original 500GB Festplatte. Ausführung Slim 500GB "NIER Automata - Emil Edition". "NIER Automata - Emil Edition". HDMI-Anschlusskabel für TV. Die Konsole weißt eine Firmware-Version vonv 1.01 auf! Original Playstation 4 Konsole (Firmware-Version 1.01) in Schwarz. - Gebrauchsspuren an der Konsole. - Kratzer (speziell an den Hochglanz Bauteilen). The outer box may have a few small tears but these will be tape up well with clear tape and hardly noticeable. Model Number: CUH-1003A (May Vary). Incluye mando. Echa un vistazo a misotros artículos ! Buen estado probada y funcionando a la perfeccion. Box is in good condition a part from the top left as shown in pictures. This bundle includes. Drive Club. Wolfestein the old blood. Mortal kombat X (used). Ufc (used). Call of duty WW2 (used). Call of duty ghost (used). Self-pick up service will not be provided. Cancellation Request within 24 hours A warranty card is not required for our warranty service. eGlobalcentral reserves the right to withhold any order from dispatch for security reasons. 500GB Hard drive, professionally refurbished and cleaned, newest system software has been installed, ready to play. Original Playstation 4 Konsole Limited Edition (Destiny) in Weiss. - Gebrauchsspuren an der Konsole. Integrierte Original 500GB Festplatte. HDMI-Anschlusskabel für TV. Microsoft XBOX ONE Konsole 500GB Schwarz Contr. 129,95 EUR.